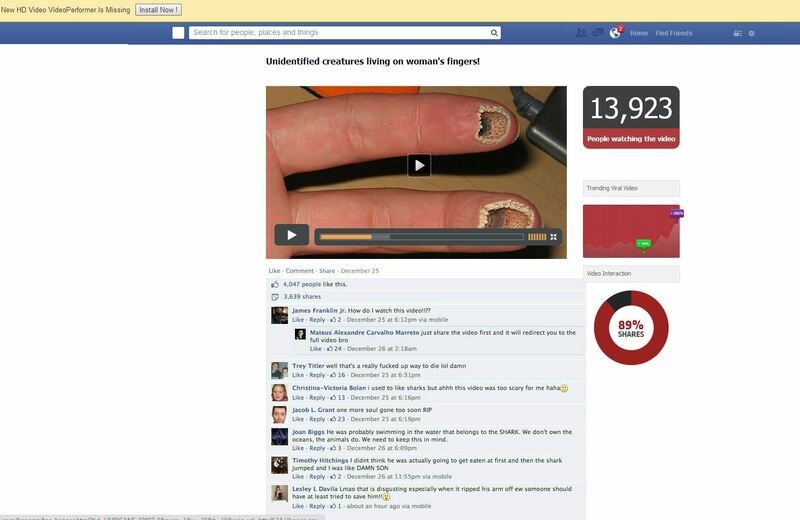 Be aware of the ‘Unidentified creatures living on woman’s fingers!’ Facebook hoax which is currently being shared on the social media network. The hoax is luring unaware users to a malicious website which will try to install malicious applications on the visitors devices. The scammers or cybercriminals behind the scam, are using fake advertisments to install malicious applications. If you visit the Unidentified creatures living on woman’s fingers website, you will be shown a ‘upgrade’ function for the video codec. This scam is often used to install a virus on a computer or device. The hoax demands the unaware users to share and like the fake video, once the video has been shared they will be redirected to a website which will serve revenue generating ads. These ads are used by the cybercriminals as this allows them to earn a fast online revenue.